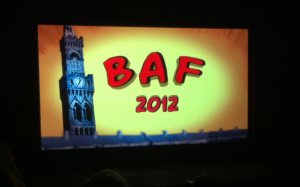 We spent another exhilarating 4 days at the Bradford Animation Festival, which true to form was it’s usually extremely friendly and diverse festival, screening interesting and diverse programmes of films. We made new friends and met many old friends and watched some great programmes. Joanna did her life drawing workshop with 15 students, which we think went down really well and Jo had good feedback. I made a point of attending as many student programmes as possible – for me it’s really important to see and recognise up coming talent and if possible to mix with and talk to the students – they are the future of animation after all. One of the most outstanding films for me was ‘Oh Willie’ by Emma De Swaef and Marc James Roels, a beautifully executed piece which manages to combine humour, pathos and mystery in a dreamlike flow to create a memorable film full of atmosphere, texture and intrigue. Some of the vignettes will live with me for a long time – I’m thinking of the exterior nocturnal ‘crapping scene’ with the plane passing overhead and the cave entrance scene where the repeating image of the young goat meets it’s demise at he hands of the ‘beast. It’s a multi layered piece open to many interpretations but above all it’s original and intriguing. In the event ‘Oh Willie‘ won best animated film of the Festival, a very popular Jury decision. Another equally applauded Jury decision was the best short animated film going to Calo Vogele, Spain for ‘Una fortuna lagrima’ a simple but highly effective and moving stop motion short, which I was privileged to be asked to announce the winner. Not having ever seen ‘Brave’, I took the opportunity to catch the screening and found it an impressive piece, bravely and effectively using Scottish accents throughout with no hint of the usual US homogenised voices – for me a far more interesting film, I think, than Laika’s ‘ParaNorman’ ,which despite it’s impressive pioneering stop motion technique lapsed into cliché and predictability. Unfortunately I missed the talk on ‘ParaNorman‘ by Laika’s Mark Shapiro. I did manage to watch ‘Junkyard’ Hisko Hulsing’s dark magus opus, 6 years in the making and a very impressive and powerful film, which won at Ottawa. I made friends with Hisko a highly creative and interesting guy. I bored the pants off him with tales of my brother’s obsession with all things Dutch! Joanna and I are always delighted to be a part of this wonderfully inclusive and warm festival and our special thanks go to Deb Singleton and all the staff and volunteers who make this festival such a pleasure to attend.